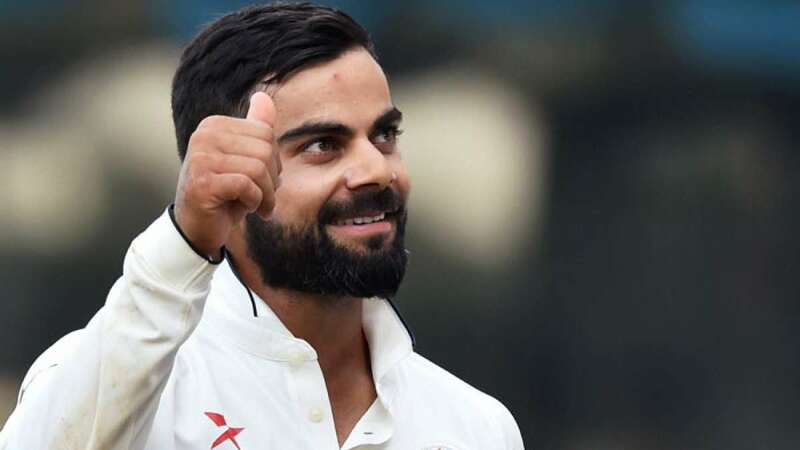 Dubai : Indian captain Virat Kohli held onto the second spot in the year-end rankings for Test batsmen just behind Australian Steve Smith, while Cheteshwar Pujara remained at the third spot. According to the last rankings of 2017 released by the International Cricket Council (ICC) here on Sunday, Kohli has amassed a total of 893 points with Smith enjoying a comfortable lead at the top spot with 947 points. Pujara is trailing Kohli by 20 points. Smith's contributions of 76 and 102 not out in the fourth Ashes Test in Melbourne have not only strengthened his position at the top of the table but also given him sole possession of second place for the highest-ever ranking points. For his efforts in Melbourne, Smith earned two points and is now 14 points behind Don Bradman (961) and two points ahead of Len Hutton (945) in the all-time list. Meanwhile, a magnificent unbeaten double century by England opener Alastair Cook in the fourth Ashes Test in Melbourne has helped him to finish the year inside the top 10. The 33-year-old left-hander remained not out on 244 in his side's first innings score of 491, which has helped him to jump nine places to the eighth position. He will now start 2018 with South Africa's seventh-ranked Hashim Amla firmly within his sights. Amla is 17 points ahead of the former England captain. Cook had begun the year in 15th position, and had entered the Ashes at the 10th spot. England captain Joe Root is the other batsman to improve his ranking, when he moved up one place to join New Zealand skipper Kane Williamson at the fourth place. Root and Williamson had started 2017 at the third and fourth positions respectively. Australia opener David Warner is at sixth, 24 points behind Root and Williamson, after his scores of 103 and 86 in the fourth Ashes Test earned him 30 points. Warner had started 2017 at the fifth position. In the rankings for Test bowlers, there is no change in the top nine with England's James Anderson leading the field. Anderson had started the year on 810 points in sixth position and has finished on 892 points at the top spot. The spin trio of Ravichandran Ashwin, Ravindra Jadeja and Rangana Herath had started 2017 in the top three positions, and have finished at the third, fourth and sixth places, respectively. Australia pacer Josh Hazlewood started and finished the year at the fifth spot. The only change in the top 10 is the return of South Africa fast bowler Morne Morkel to the 10th position. The 33-year-old claimed a haul of 5/21 in Zimbabwe's first innings for which he has been rewarded with a rise of three places, which has now put him one place ahead of compatriot Dale Steyn. It is for the first time in nearly two years that Morkel is within the top 10. Morkel's team mate Keshav Maharaj, who returned 5/59 in Zimbabwe's second innings, has gained two places and is now at a career high 16th position. Outside the top 20, Chris Woakes of England and Australia's Pat Cummins have moved up three places each. Woakes is now in 28th place, while Cummins is now ranked 36th. Shakib Al Hasan of Bangladesh is the top ranked all-rounder and he is followed by India's Ravichandran Ashwin.